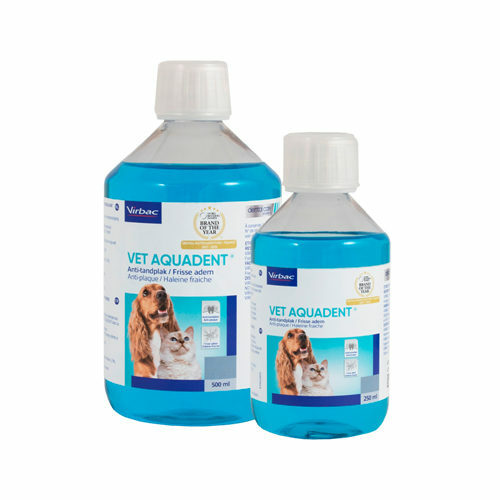 Vet Aquadent is a tasty liquid that fights plaque, tartar and bad breath. Vet Aquadent is a liquid supplement that can be mixed into your pet's drinking water. Contains xylitol. This substance inhibits the growth of bacteria in the mouth, preventing the build-up of plaque and tartar. Xylitol gives your pet a fresh breath. This liquid contains very low levels of Xylitol. Xylitol is absorbed by bacteria, this prevents glycolysis and the uptake of glucose into cells. This means that bacteria cannot multiply, so more than 50% of plaque and tartar accumulation is eliminated. Virbac Vet Aquadent can simply be added to your pet's drinking water. Each time your pet has a drink, their teeth are automatically protected. Each time you change their drinking water (preferably daily), you can add 5 ml of Vet Aquadent per 500 ml of water. Do not use for cats and dogs younger than 6 months. Have you used Vet Aquadent before? Let us know what you think about this product.